After World War I and during the gradual break-up of Austria-Hungary, the city at first became a part of the transient “Eastern Slovak Republic”, declared on 11 December 1918 in Košice and earlier in Prešov under the protection of Hungary. On 29 December 1918, the Czechoslovak Legions entered the city, making it part of the newly established Czechoslovakia. However, in June 1919, Košice was occupied again, as part of the Slovak Soviet Republic, a proletarian puppet state of Hungary. 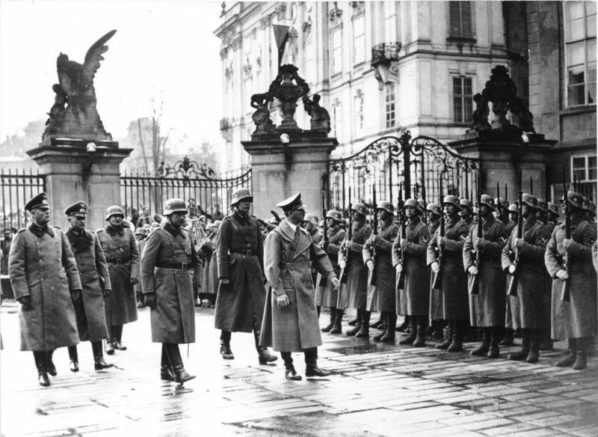 The Czechoslovak troops secured the city for Czechoslovakia in July 1919, which was later upheld under the terms of the Treaty of Trianon in 1920. Jews had lived in Košice (Kaschau) since the 16th century but were not allowed to settle permanently. There is a document identifying the local coiner in 1524 as a Jew and claiming that his predecessor was a Jew as well. Jews were allowed to enter the city during the town fair, but were forced to leave it by night, and lived mostly in nearby Rozunfaca. In 1840 the ban was removed, and before that there were a few Jews living in the town, among them a widow who ran a small Kosher restaurant for the Jewish merchants passing through the town. Košice was ceded to Hungary, by the First Vienna Award, from 1938 until early 1945. The town was bombarded on 26 June 1941 by a still unidentified aircraft, in what became a pretext for the Hungarian government to declare war on the Soviet Union a day later. Remark: This Nazi Germany Passport – Protectorate of Bohemia and Moravia, Kaschau was issued in Sep 1941. The German occupation of Hungary led to the deportation of Košice’s entire Jewish population of 12,000 and an additional 2,000 from surrounding areas via cattle cars to the concentration camps. In 1946, after the war, Košice was the site of an orthodox Zionist revival, with a Mizrachi convention and a Bnei Akiva Yeshiva (school) for refugees, which, later that year, moved with its students to Israel. After the Communist Party seized power in Czechoslovakia in February 1948, the city became part of the Eastern Bloc. Several present day cultural institutions were founded and large residential areas around the city were built. The construction and expansion of the East Slovak Ironworks caused the population to grow from 60,700 in 1950 to 235,000 in 1991. Before the breakup of Czechoslovakia (1993), it was the fifth largest city in the federation. The Protectorate of Bohemia and Moravia (German: Protektorat Böhmen und Mähren; Czech: Protektorát Čechy a Morava) was a protectorate of Nazi Germany established following the German occupation of Czechoslovakia. Earlier in 1938, with the Munich Agreement, Sudetenland territory of Czech Lands was incorporated into Nazi Germany as a Reichsgau. The German government justified its intervention by claiming that Czechoslovakia was descending into chaos as the country was breaking apart on ethnic lines, and that the German military was seeking to restore order in the region. Czechoslovakia at the time under President Emil Hácha had pursued a pro-German foreign policy; however, upon meeting with German Führer Adolf Hitler, Hácha submitted to Germany’s demands and issued a declaration stating that in light of events he accepted that the fate of the Czech people would be decided by Germany; Hitler accepted Hácha’s declaration and declared that Germany would provide the Czech people with an autonomous protectorate governed by ethnic Czechs. Hácha was appointed president of the protectorate the same day. The Protectorate was an autonomous Nazi-administered territory which the German government considered part of the Greater German Reich.The state’s existence came to an end with the surrender of Germany to the Allies in 1945. A rare passport historical document nowadays, documenting the above said. The passport shows a teacher couple, Grigory Kaminsky and his wife Marie and was issued by the German Consulate in Kaschau in Sep 1941 and was valid till Sep 1944 (two passport renewals). Page one shows at the lower margin “Protektorat Böhmen und Mähren” and also a stamp at page six shows the same. The passport shows no travels (maybe no wonder at these times for this area). An outstanding collectible – Nazi Germany Passport – Protectorate of Bohemia and Moravia, Kaschau. Here are some pictures.